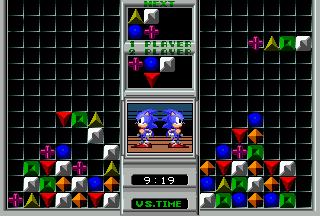 Sonic Eraser (ソニックイレイザー) is a 1991 puzzle game that was downloadable for players that had Sega Game Toshokan, an online game downloading service for the Sega Mega Drive in Japan. Because the service is now long defunct, the game was unknown to much of the Sonic community for a time. The game was later released in 2004 on Sega of Japan's website, and it received more widespread attention as it was noticed by English-speaking Sonic fans this time around. Sonic Eraser was unknown to the Sonic community until 2004, when Sega launched an online system on their Japanese website, which for a small fee per game, allowed users to download and play some original Mega Drive games. Included in the selection were a number of games only released on the Sega Game Toshokan system in Japan. In February 2004, Phugolz, owner of the major Sonic scene website Sonic CulT, discovered the online service and purchased several games, including Sonic Eraser and various other previously unreleased Sega Meganet games. The ROMs provided by the online service were packaged with a licensed version of the emulator Gens and came in the form of self-contained CD images that were encrypted and therefore could only be loaded by the software provided by Sega. Nemesis wrote a tool capable of descrambling the encrypted images and converting them to normal ISO images. Once in the form of an ISO, the ROMs were simply copied out and were released on Sonic CulT. 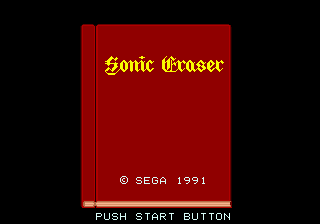 Almost immediately after the ROM of Sega Eraser was released, a fan translator named D translated the game's text to English. 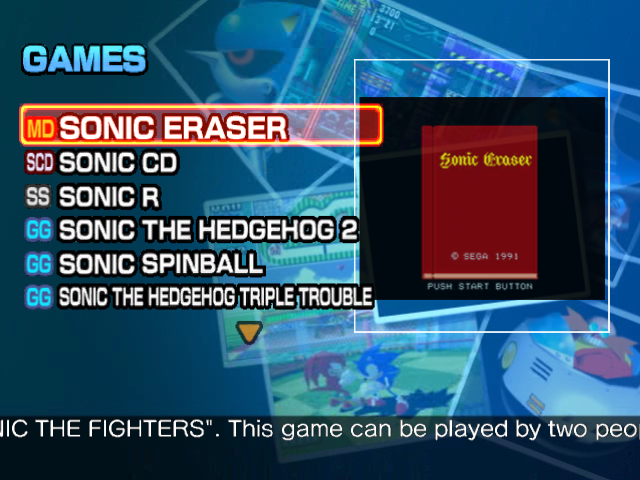 Sonic Eraser is a fairly simple puzzle game. Sets of colorful geometric shapes in sets of 4 descend from the top of the screen. The pieces must be matched up in order to clear the players area of the screen. If the pieces should pile all the way to the top of the screen where incoming pieces fall the game will end for that player. There are 2 multiplayer options, 1P and 2P is a competition to see who can amass the most points. 1P vs 2P is different, when a player gets a combination of three consecutive matches of pieces, that player's Sonic attacks the other player's Sonic. As a result, the other player will momentarily lose control of their pieces. The time limit in this mode is 10 minutes. The game offers 4 unique modes of gameplay. Normal Mode: In this mode, the player simply matches pieces to gain a high score. The better the performance of the player, the higher the difficulty level will rise and the speed at which clusters fall increases. Round Mode: This is sort of a puzzle mode consisting of 10 stages. The object is to clear the whirlybob pieces from the playfield by eliminating the shapes between them. The time limit is 3 minutes for each round, and pausing the game doesn't stop the clock. Doubt Mode: The gameplay is the same as Normal mode except that white squares don't drop down. Instead, a single shape from almost every cluster will turn into a white square when it hits the ground. Block Mode: This mode allows clusters to stand on-end rather than having parts of the cluster break off the cluster if nothing is underneath it. This page was last edited on 10 April 2018, at 14:15.